Summer if fast approaching, you guys! And what says summer more than a fun picnic blanket? Nothin’, I tell ya! 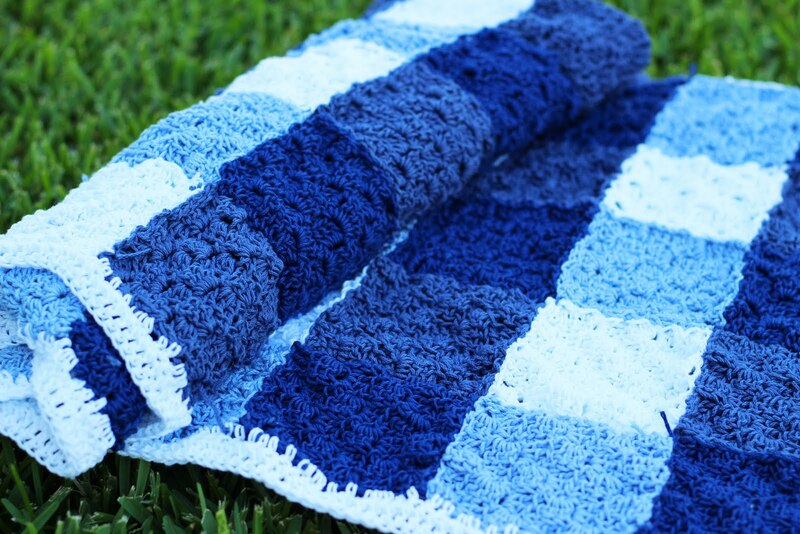 This easy afghan is made of Lion Brand’s new 24/7 Cotton yarn (scroll to the bottom of this post for a giveaway ending 5/8/16). It is much more durable for outdoor play at the park, beach, or anywhere! I loved working with this yarn, it has wonderful rich color and is probably the softest cotton I’ve worked with yet. I think you’ll be seeing more of this yarn on the blog! In order to achieve the gingham look I worked lots of small squares using the C2C or corner to corner crochet method, then sewed them together. It was a bit time consuming, but so well worth the end result – I know my family will enjoy lunching on this baby for years to come! 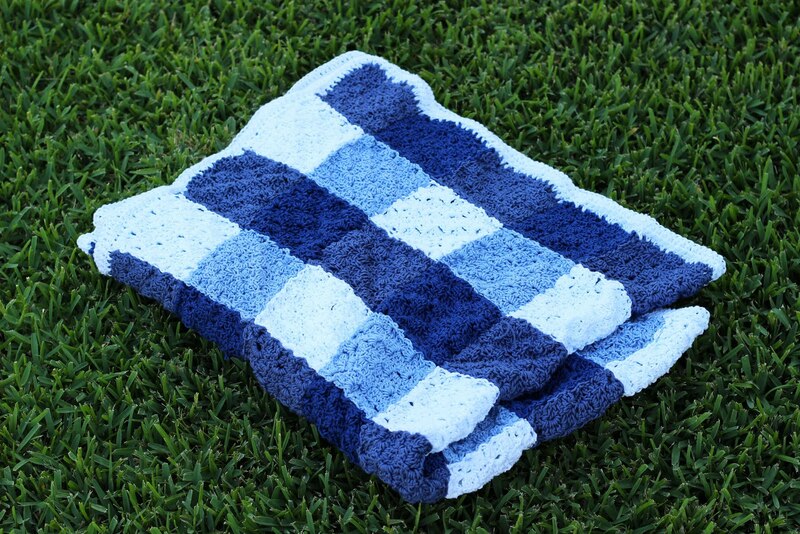 My blanket measures about 45″ wide by about 30″ long, so I’m calling this a baby or kids size. 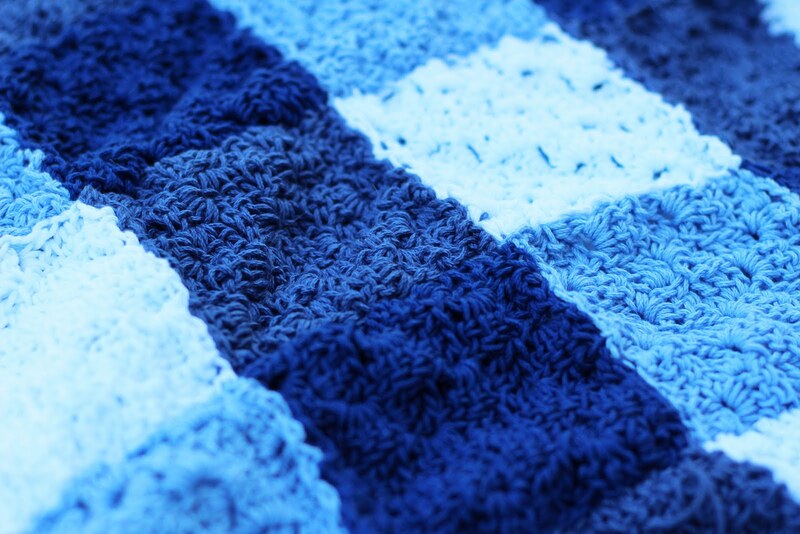 Using this same method you could make a blanket as big or small as you like! Go ahead and make 20 each of these 6×6 squares in sky, denim, navy, and white. You should have 80 individual squares total at this point. 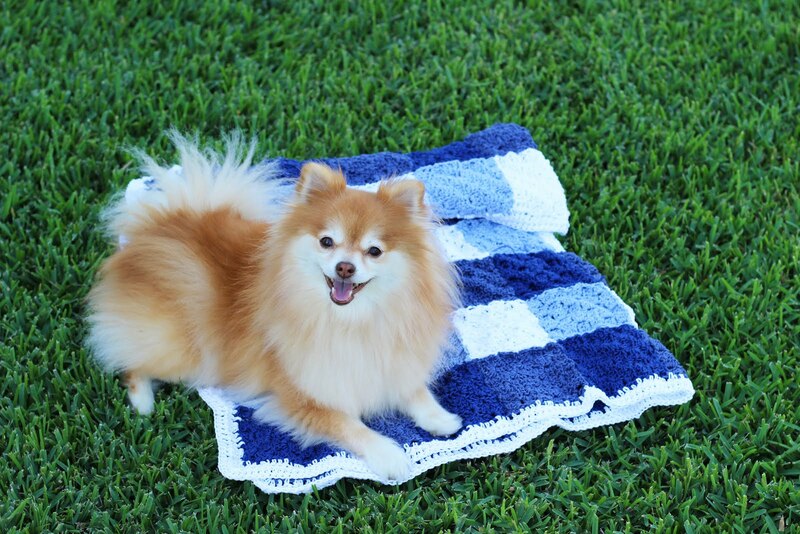 After you have all those squares done, it is time to lay out your gingham pattern. Each row will have 10 squares. Now to sew them together! Working with each row individually, I used Denim to sew together rows 1, 3, 5, and 7 using a basic whip stitch and my tapestry needle. I used Sky to sew together rows 2, 4, 6, and 8. 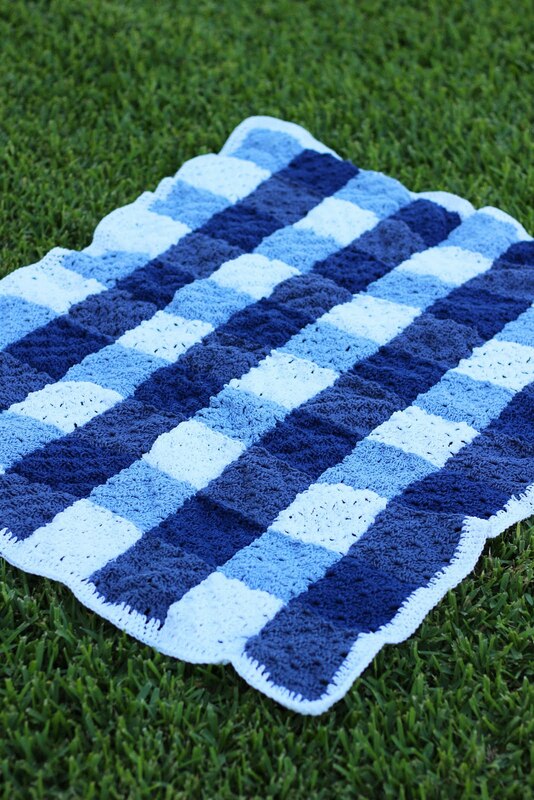 Tips: Try your best to line up your blocks as best you can – if they are sewn together wonky, your blanket won’t come out with a nice gingham look! 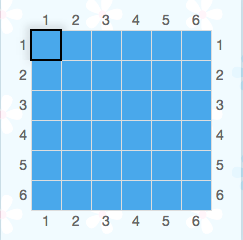 Also, be sure that all of your odd rows begin with a Navy square and end with a Denim square. All of your even rows should begin with a Sky square and end with a White square. Now, using White I whip stitch the rows together. Be sure everything is facing the right way and your squares are lining up. Double check your arrangement here, frogging this is no fun! I stitched a simple Dc border around the entire picnic blanket in white, going around the perimeter with two rows of Dcs (and a cluster of 3 Dcs in each corner), finish off, weave ends. Now, for the giveaway!Enter via the rafflecopter widget below to win all the yarn you need to make this project. Also be sure to head on over to the Lion Brand website – 24/7 Cotton is 20% off til the end of May! 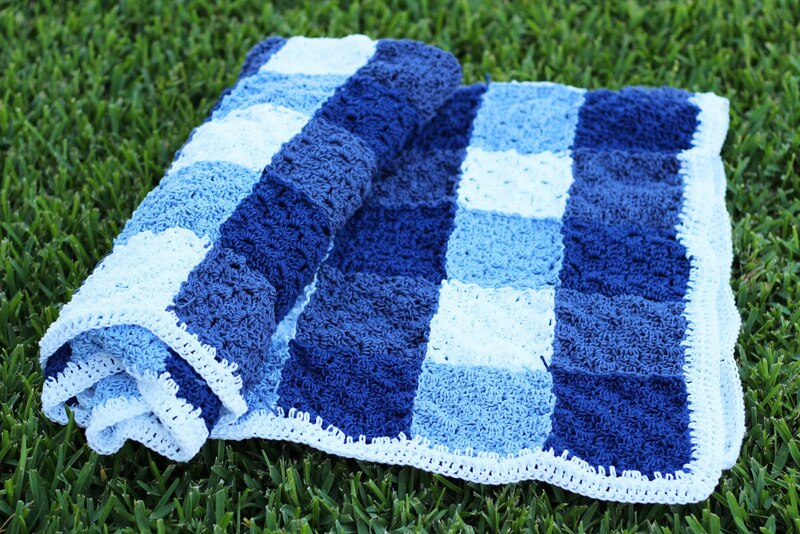 This crochet picnic blanket is fun and simple, just the perfect thing for summer fun! I could also see this making an adorable summer gift wrapped up nicely in a picnic basket with a yummy lunch all ready to go! Who’s going to picnic this summer?